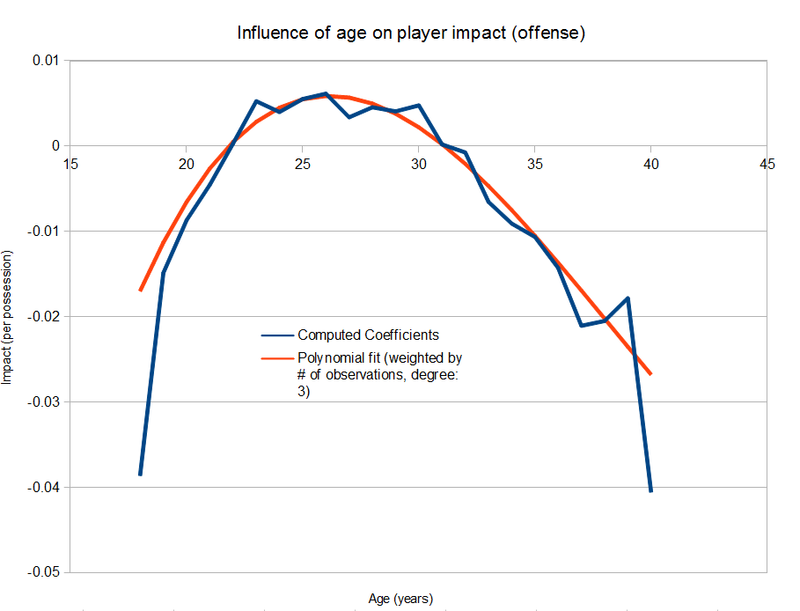 Here's the analysis regarding influence of age on player performance I originally submitted to SSAC '13 but did not present. It uses matchupdata from '00 to Dec. 2012. What I had done is treat player age as an additional player on the floor, then compute coefficients for each age with RAPM. Survivor bias is a problem here. These numbers don't represent "expected performance", but instead "expected performance IF the coach actually decides to give that player minutes"
The individual lines for offense and defense are jerkier. It also has to be noted that the y-axis actually represents influence per 200 possessions, not 100. That is if one, like me, assumes ~192 possessions total in a game. I'll assume the low value for age 19 is because of the lack of priors, right? I assumed you used integer ages instead of decimal (incorporating days.) Then ages 19 and older then would all be dummy variables. Did you think about making age a continuous variable? If you want to model a polynomial of that shape, you can use something easy like beta1*age-beta2*age^2+beta3. 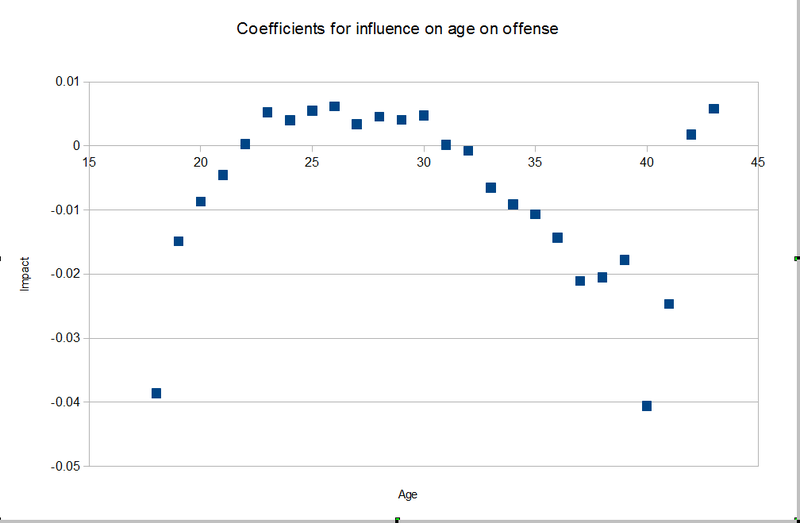 Do offense and defense peak in different ages? This is a pretty cool concept. Is everything still done in a "bayesian" updating in this iteration of RAPM? If so, I would guess that this graph could be used to represent year-to-year deltas. If not, the deltas would be something more like Y-value(year1) minus Y-value(year2). In this specific analysis there are no priors involved except for the standard zero prior everyone gets in standard RAPM. Just wanted to add a few observations (mostly questions) about this very interesting result. (1) Does it make sense that the average (fitted) performance of players is positive between about ages of 20 and 35? Isn't there some adding-up constraint that makes overall average performance equal zero? The vast majority of possessions are played by that cohort, and shouldn't that be balanced out by the negative performances of the young and old? What am I missing? (2) Do age-adjustments really matter "much"? I get that including them improves the fit of +/- regressions, but how much of an adjustment does it impart to an average player rating? Consider the case of Kevin Durant. He is a young player, one whose ratings are diminished by not taking into account his age-related improvement. As I read Jeremias' plot, the average 24 year old was expected to be about 0.3 points per 100 possessions better than the year before. How much might his age-adjusted (x)RAPM improve by incorporating this fact? Here's my stab at an answer. KD played 42% of his 2012-13 minutes as part of the following line-up: Durant (age 24), Ibaka (23), Perkins (28), Sefolosha (29), and Westbrook (24). And this is a pretty good representation of the age structure of the remaining 58%. And what you get when you take the average of the expected age-related changes of all these players and subtract these from those of the individuals is, well, not much. KD's expected 24 year old improvement of about 0.3 is shared in part with Perkins and Sefolosha, but he in turn is subsidized to smaller degree by Ibaka (23 year olds having a slightly larger expected improvement than 24 year olds). In the instance, given how I eyeballed the plot, I get that KD's rating, per this line-up, is about 0.06 lower than a non-age-adjusted would be. And this would seem to be a pretty good representative figure for the rest of his minutes. Now, such cross-subidies will vary in lineups depending upon the age structure. Pity the young player who only plays with teammates significantly over 29 years of age and above (and whose average competition is also over the hill). He would be more screwed. But such results should be very rare, and the upper-bound is still not "large". Is my intuition incorrect on this point? Is it possible for age-adjusted +/- measures to differ more from their unadjusted counterparts, and if so, why? (3) Coaches are the real beneficiaries of the failure to age-adjust +/- regressions. The average age in the NBA is about 27, and according to Jeremias' results (assuming I am interpreting them correctly) such players are expected to improve by about 0.1 per 100 possessions. Perhaps I am not thinking about this correctly, but when you then throw coaches into an age-unadjusted +/- regression, all expected age-related player improvements will be assigned to coaches, implying that on average coaches' ratings are bumped up by about 0.5. And I suppose in this context I should make particular note of Gregg Popovich, because I do recall having previously commented on his slightly negative rating in the aforementioned regression. Gregg Popovich, of course, is well known (or should be) for having consistently coached above average age rosters. I am too lazy to check at the moment, but I think they have averaged slightly above 29 years. As such, in line with the argument above, GP might not in fact be a "net negative" coach. Rather, adjusting for his slightly past-prime players, he could be expected to have an approximately zero rating, which would make him a bit above average. Goes up almost steadily until age 29, then steadily drops until age 33. After that, the coefficients are all over the place. - Sample size: There simply aren't many players that play after age 37, let alone age 40. 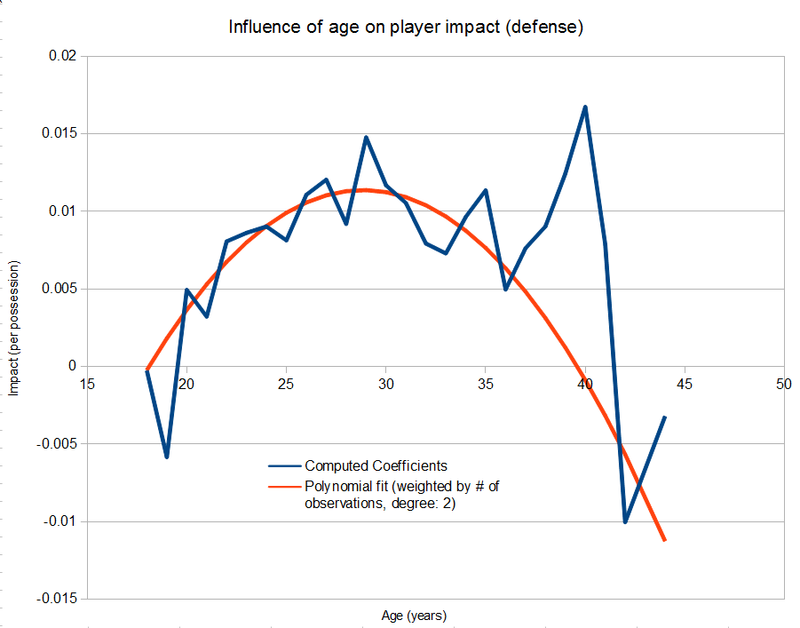 The smaller the number of players of that age group in our sample, the harder it becomes for the regression to estimate a reasonable coefficient. On the up-slope (18-23) each year has a more positive coefficient than the preceding year, and on the down-slope (31 and after) most years have a more negative coefficient than their preceding year, .. The curve is intuitively appealing, but it looks like a straight-line increase up to age 23, and a straight dropoff by year after 30. Basically a plateau from 23-30. 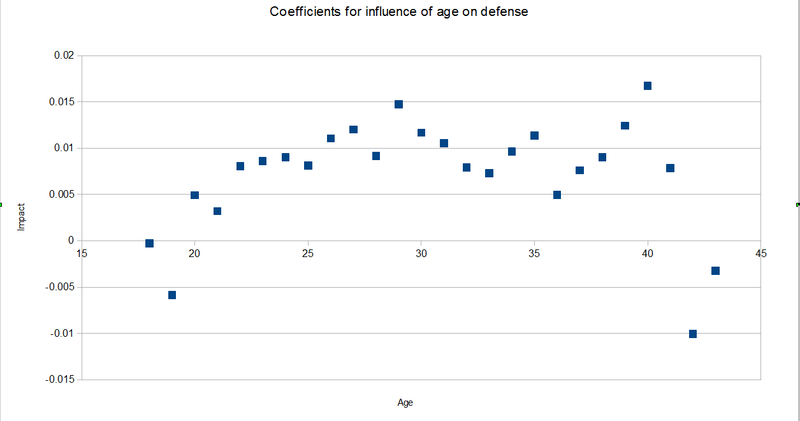 The equivalent defensive plateau age range looks like 25-32 -- just about 2 years later/older than for offense. Intuitively about right. A single integer for age in a given season is rather arbitrary. A lot of smoothing could be had by assigning, for example to age 25: the sum of 1/4 of the value of the age 24 group, 1/2 of age 25, and 1/4 of age 26. Oftentimes a player goes 1/4 or more of a season after a birthday. J.E. wrote: - Sample size: There simply aren't many players that play after age 37, let alone age 40. The smaller the number of players of that age group in our sample, the harder it becomes for the regression to estimate a reasonable coefficient. The two issues are related. A player on the down side of his career will only get to play in year Y+1 if he was good (luckily good) in Y. So the observed deltas will be biased large. There are several possible solutions discussed at length in baseball research, where the randomness effect is far more pronounced. 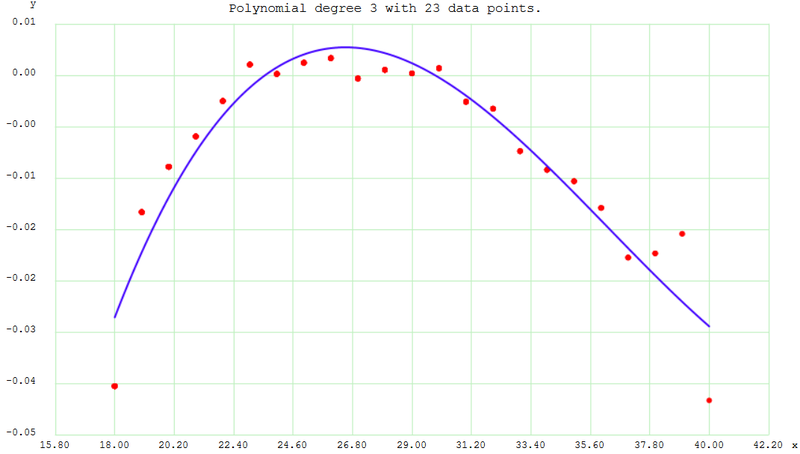 Another question: are your polynomial fit curves weighted by the number of observations of each delta, or just based on the points shown with no weighting? Great work once again, J.E.! Mike G wrote: A lot of smoothing could be had by assigning, for example to age 25: the sum of 1/4 of the value of the age 24 group, 1/2 of age 25, and 1/4 of age 26. 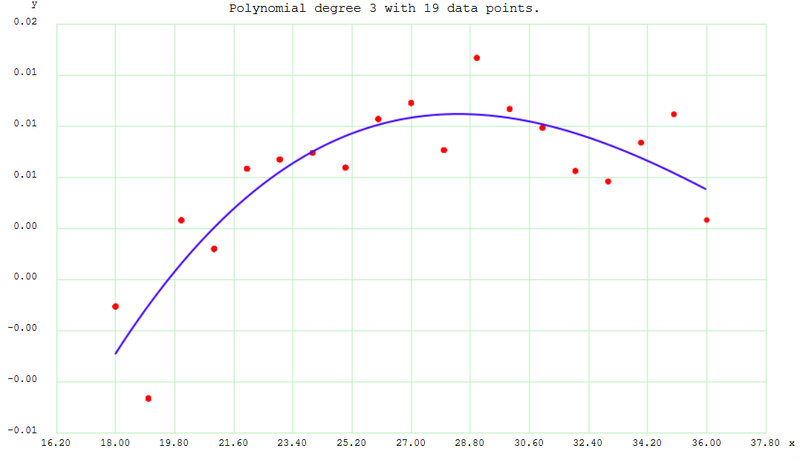 DSMok1 wrote: Another question: are your polynomial fit curves weighted by the number of observations of each delta, or just based on the points shown with no weighting? Do you have links to papers or blog-posts that deal with this issue? I was going to say weighing by number of possessions would help the model fit the points for ages 39 and higher. I've done that a lot to deal with the extreme ranges of datasets. So you're using an integer age and not decimal? Maybe you can use "exact" decimal age by putting in the polynomial factors (age, age^2, age^3, etc.) in the RAPM model instead of separate coefficients for each year. The problem with survivor bias is say there are three players: A, B, and C. Player A is a weird Stockton-type who plays well until he's 40. Player B falls off sharply at age 35 and is out of the league by 36. Player B declines every year from age 32 to 35 before retiring. He tries to make a team at age 36 but no one signs him. So there has to be a way to penalize an age that causes player to retire/drop off in playing time. I'm not sure how to do that, however.... (Helpful, I know.) But this is an area of stats I do want to learn more about. Obviously not the same level of research, as I am a sophomore in college and had very limited time and slightly incomplete data, but I did a project on the aging of offensive and defensive xRAPM and got some (obviously flawed but) potentially interesting results (link below). Obviously sample bias was the overriding issue because of the qualifier, and the discussion about getting around it is more important than the results themselves, but I still think there are some useful takeaways, at least for further research. First off: more evidence that age is a very significant predictor projecting NBA performance from college, as younger players are generally better talents, hence they are drafted earlier. Interesting but may or may not be real: it looks like the discrepancy in defense between players drafted at younger ages vs. older ages is, on average, much bigger than the discrepancy in offense (without accounting for variance, which will be larger for offense). It also looks like, on average, defense declines much more gradually than offense. Of course part of this will be explained by the fact that players drafted at younger ages are higher picks and more athletic. And the usual caveats with defensive metrics apply. Potential improvements include: adding an Injury variable, adding a Cumulative Minutes Played or Cumulative Possessions variable (getting rid of the Experience term), making Possessions a lag variable, estimating the rate of change rather than the actual value, and using "total value over replacement" rather than the rate stat. The real value is going to be found in adjusting for position/player type, as most empirical and anecdotal evidence says offense peaks earlier and defense (particularly big man defense) peaks later and declines more gradually. Link includes summary and paper. Paper is long and technical as the intended audience was the professor; summary is much more to the point. Would love to hear what everyone thinks. Thanks. Did weighing by # of observations, and figured out the 'optimal' polynomial degree empirically through Out-Of-Sample-Testing, instead of choosing it arbitrarily. Jeremias, can you post a graph w. O + D? Excellent work on the new curves! Well, I'd consider Tangotiger the best public authority on this, but his blog can be hard to search. Some recent articles on this issue, known as survivor or survivorship bias. There are many more threads at Tango's blog covering this issue, but I can't uncover them all.